Today’s victory was by no means flawless, but arguably that is what made it all the more impressive; it showcased the ability of this young team to wrestle back the initiative despite not being at their best. In short, it showed dogged determination and character. That bodes well for the future. It seemed today was going to be "one of those days" for Pakistan. Certainly, lady luck was shining down on Australia on the morning of the final. The toss went Australia’s way and they made the most of batting first, compiling a 95-run opening partnership in no small part thanks to edges and mistimed hits. Pakistan, it has to be said, didn’t help themselves. They started poorly with the ball and lacked intensity in the field; the signs were ominous. At 96/1 after ten overs, the platform was set for Australia to launch. Not least because Pakistan, somewhat unusually, only had five proper bowling options. Australia, it seemed, had one hand on the trophy. However, Pakistan captain Sarfaraz Ahmed marshalled his troops and in the second half of the innings the bowlers belatedly answered his call. The turnaround was remarkable, and the decision to keep Amir’s remaining overs for the back end proved to be a masterstroke, with Australia only managing to score 17 runs and losing four wickets in the last 14 balls. Australia’s hopes of scoring 200+ had been dashed and they spluttered and crawled to 183/8. Pakistan had given themselves a chance but Australia were still slightly ahead at the halfway stage. For Pakistan to chase down 184 and win the final, they would not only need to break the record of the highest successful chase at the Harare ground but more importantly Pakistan would need to post their highest ever successful chase in T20Is. Add to that Pakistan’s poor record against Australia in finals and it’s fair to say history was not on Pakistan’s side. 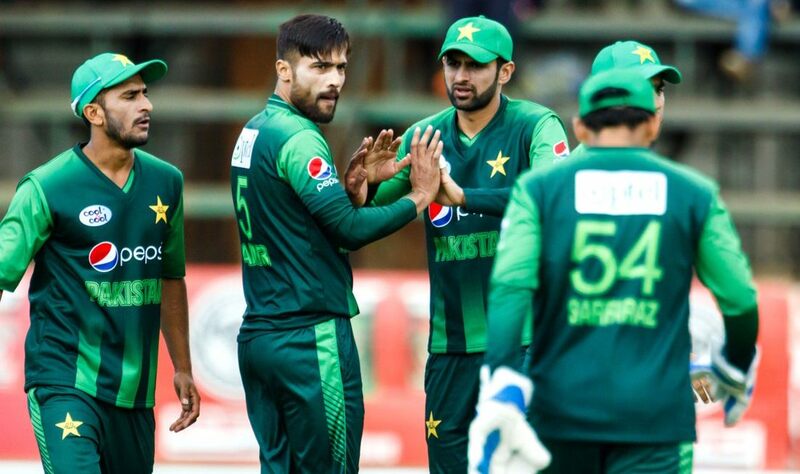 The absence of the number 1 ranked T20I batsman Babar Azam had left a gaping hole in Pakistan’s batting line up, and if Pakistan were going to give themselves the best chance of winning this match, the batsmen would need to make the most of the momentum the team had earlier wrestled back from Australia. It’s fair to say they didn’t. In fact Pakistan could hardly have started their innings worse; after four deliveries they found themselves 2/2 on a flat track against the innocuous bowling of Glenn Maxwell. The collapse seemed all too familiar for Pakistan supporters and a heavy defeat beckoned. Fakhar Zaman, however, had other ideas. Not only did Pakistan go on to win - they did so comfortably. Fakhar took the game by the scruff of the neck and scored a scintillating 91 off 46 balls, aided by Sarfaraz (28 off 19) and Malik (43* off 37). By the time Fakhar was dismissed, he and Shoaib Malik had shared a masterful 107-run stand in 64 balls, and victory was in sight. The game drew to its natural conclusion with Asif Ali (17* off 11) scoring the winning runs. Pakistan have not lost a single T20I while chasing under Sarfraz Ahmed's captaincy but the quality of Pakistan’s bowling attack has meant the batting hasn’t really been tested in a high scoring chase. After all, Pakistan’s success in reaching number 1 in the T20I rankings has been in large part thanks to the quality of their bowlers. So much so, before today Pakistan have only ever been asked to chase 183+ seven times in their entire history of playing T20Is. In an era where 200+ scores are increasingly becoming the norm in T20Is, that is a quite remarkable statistic. The question that Pakistan were confronted with in today's match was whether they could maintain that record in the face of a total higher than they were used to. In spite of the first over wobble, Pakistan did so comfortably and Mickey Arthur will no doubt be pleased by the progress shown by his young team. In doing so, Pakistan have quietly enhanced their reputation as chasers in T20Is; today’s victory was Pakistan’s 10th consecutive win while batting second which is the most by any team in T20I history. Not so today. Fakhar Zaman adopted a fearless approach and where in the past Pakistan would have looked to rebuild (and in the process put pressure on themselves), the batsmen took the attack to the opposition and did not allow the Australian bowling attack to settle; there were ten overs which went for over 10, and one over went for over 20. It sent a clear message that win or lose, Pakistan were going to give as good as they got. To put Pakistan’s chase in context, it is second in the list of highest successful chases in T20Is after losing 2 wickets in the first over. To do so in a final makes it all the more commendable. For too long Pakistan have attracted the ‘mercurial’ tag. In the past, Pakistan were content to show they could win rather than seeking to win consistently. It is something Mickey is keen to change and today’s win shows strong signs of progress. Perhaps most pleasingly, Pakistan showed they can win from losing positions (with ball and bat). There will always be “highs” with Pakistan, the key to becoming more consistent is reducing the number of “lows.” Central to achieving consistency, therefore, is the ability to win from losing positions and wrestle back the initiative within a game. Today’s display shows Pakistan are on the right track. In the process, Pakistan won their ninth consecutive T20I series, with Sarfaraz continuing his winning streak as captain.